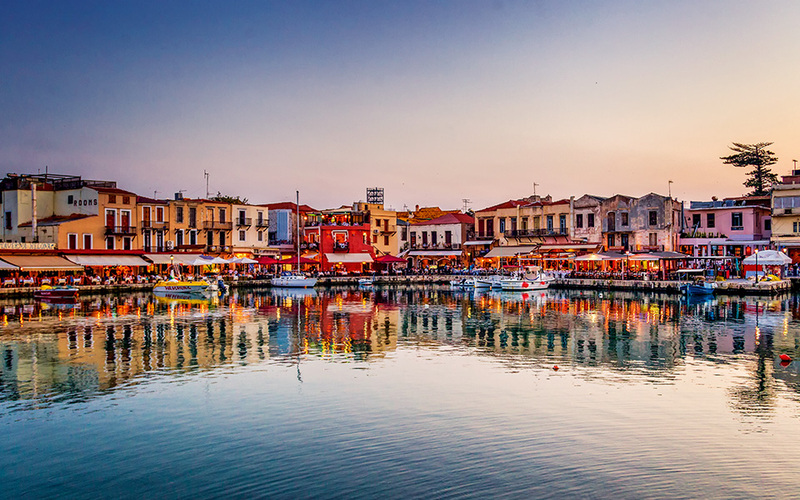 A drink or a meal at one of the cafés lining the Venetian Harbor of Rethymno is a must for any visitor. 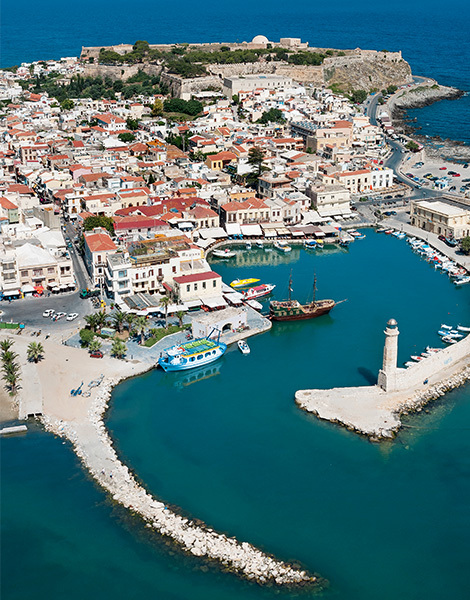 With its lively atmosphere and its photogenic mix of Venetian and oriental elements, Rethymno has many loyal fans. Rethymno is the only city in Crete which is built on a cape, and more specifically, “on the boundary between calmness and fierceness,” as the location is eloquently described by local writer Pantelis Prevelakis. To the east stretches a vast sandy beach, while the coastline is rocky to the west. Unlike Irakleio or Hania, Rethymno never had a large port that would have made it a center of trade. But it does have a wonderful old harbor, full of color, lined with Venetian and Ottoman buildings that have for centuries been reflected in its calm waters. The best time to explore the city is very early in the morning, when the light is perfect and the tranquility a sheer delight. The cool air of morning is also propitious for making your way up to the Venetian citadel, the Fortezza. When it was built (1573-1580), on the hill once occupied by ancient Rithymna, it was the largest fortress on Crete. High up on the battlements, you will feel the salty breeze from the Sea of Crete; you can walk along the old defensive trenches, between the towers, bastions and gates, among the solitary palm trees. Here, too, is the Erofyli open-air theater, which hosts the celebrated Renaissance Festival every summer. The Mosque of Sultan Ibrahim (originally the Cathedral of Aghios Nikolaos) in the Fortezza. 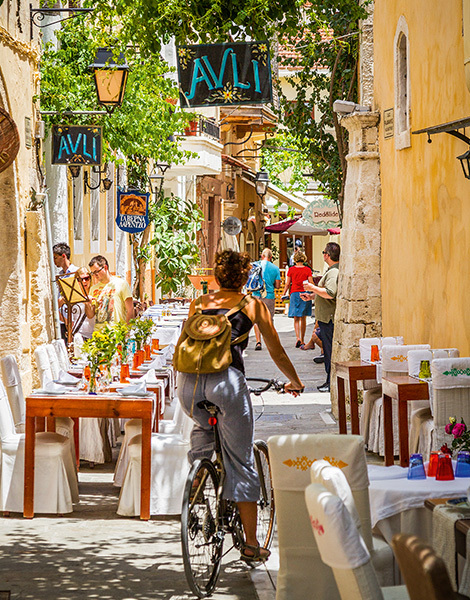 The narrow streets of the Old Town of Rethymno are lined with restaurants, cafés and shops. During their 436-year rule, the Venetians turned Rethymno into one of the most important cities on the island and created its strong association with the Renaissance. They erected splendid public buildings, churches and mansions, and they founded schools and literary societies, bringing a slice of European culture to Crete. Indeed, it is said that the Academy of the Vivi, established by Francesco Barozzi in 1562, was the first manifestation of organized cultural life on the island. The city fell to the Ottomans in 1646. The churches became mosques, while Ottoman trelliswork, wooden bay windows and covered balconies appeared above the elaborately carved entrances of the mansions. Contact with the rest of Europe was severed, but the general appearance of Rethymno did not change dramatically. What one still senses today when strolling through the enchanting labyrinth of the Old Town is primarily the Venetian legacy. The harbor of Rethymno from above. A walk to the 19th-c. Εgyptian Lighthouse is a good option for a little peace, if it gets too crowded. Rush hour in the old Turkish neighborhood of Rethymno. First stop is the 16th-century Venetian Loggia, a splendid Palladian-style architectural masterpiece where the city’s nobles once convened. 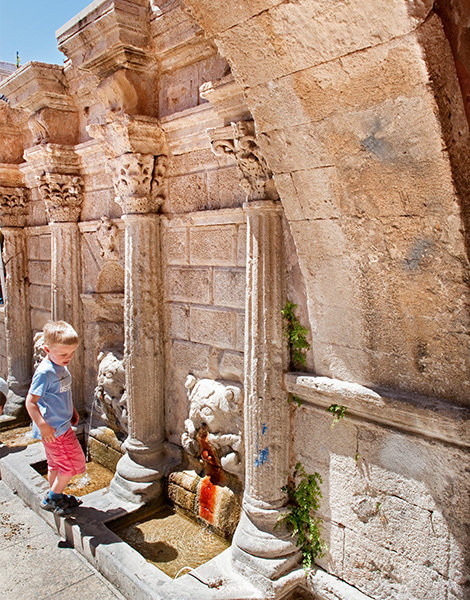 A short walk in a westerly direction along Konstantinou Paleologou Street will bring you to the Rimondi Fountain (1626), which supplied Rethymno with cool water from Mt Vrysinas. This is the top rendezvous point in the Old Town and, while you are waiting for your loved one, you can admire the fluted columns with Corinthian capitals, and the lion-head spouts. 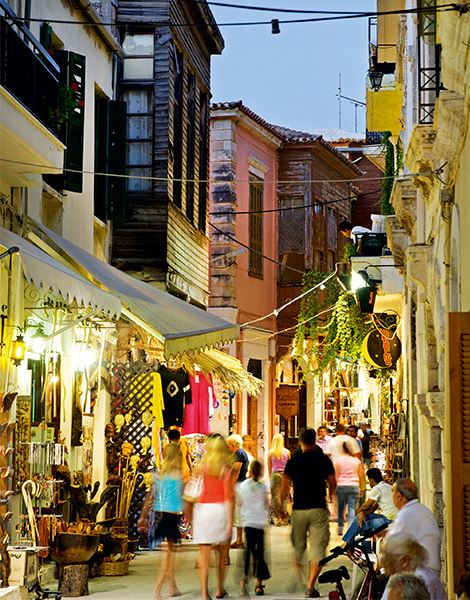 Heading south along Ethnikis Antistaseos, a shopping street that ends at the imposing Porta Guora (“Great Gate”), you will pass two of the city’s landmarks. 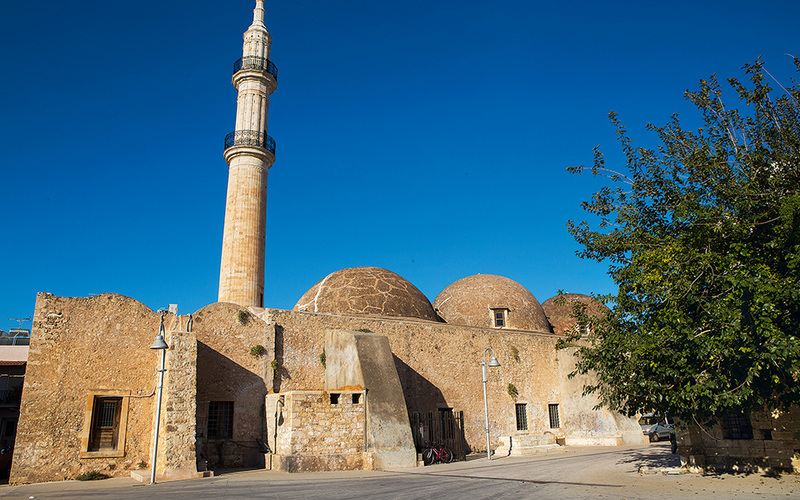 The first is the well-preserved Neratze Mosque, with its three domes and 27m-tall minaret. The impressive building was originally the katholikon (main church) of an Augustinian monastery; it was turned into a mosque in 1657 and renamed in honor of Gazi Hüseyin Pasha, who had taken the city. Today, it is also known as the Odeon of Rethymno and hosts concerts (Tel. (+30) 28313.413.01). 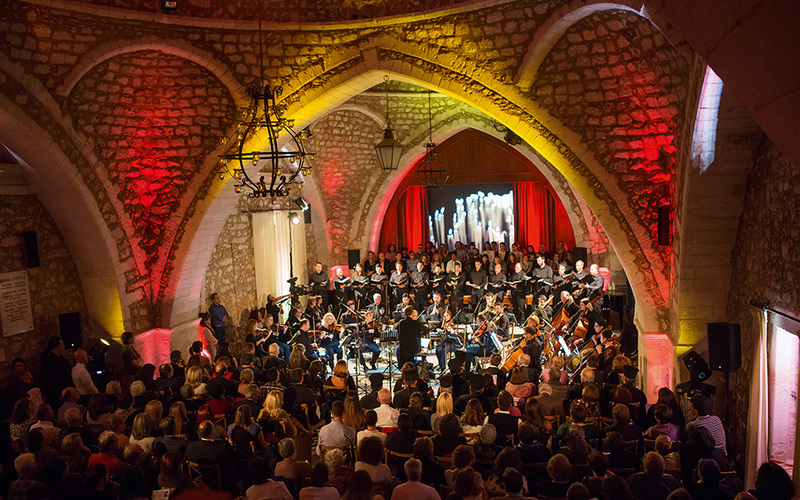 A classical music concert at the Odeon of Rethymno. 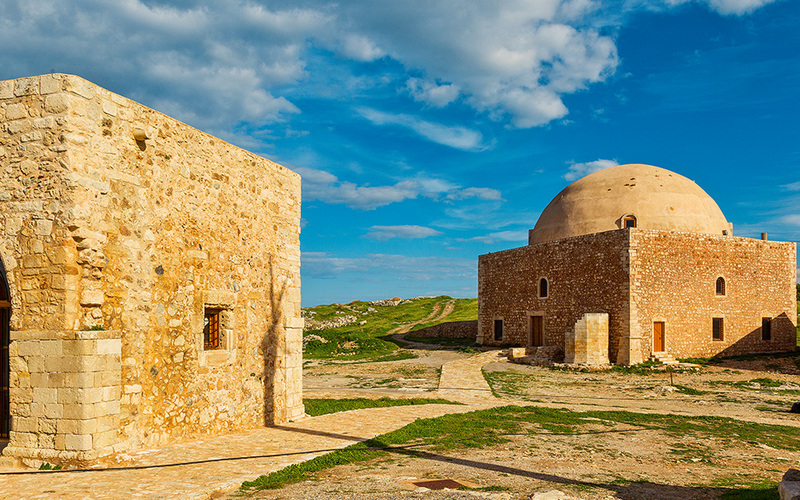 The second is the striking 16th-century Church of St Francis, that today houses the Archaeological Museum of Rethymno (Open Tue-Sun 10:00-18:00), which has a relatively small but important collection of finds, from stone age tools dating back 130,000 years to a gold coin minted in 1646 during the rule of Doge Francesco Molin. Directly behind is wide-open Mikrasiaton Square, one of the most attractive contemporary urban planning interventions in the medieval settlement. On the western side of the square you will find the celebrated Makry Steno (“Long Alley”), otherwise known as Nikiforou Foka Street. This is one of the most enchanting alleyways in Rethymno, with Venetian houses, stone fountains and the charming Church of Kyria ton Angelon (“Our Lady of the Angels”). Keep an eye out for the elegant stone lintels. Rethymno boasts over 700 such architectural gems, which often combine different architectural styles (Corinthian, Ionic, Doric, Composite) and are impressively decorated. A visit to an authentic Venetian palazzo is a must. One fine example, dating back to 1609, with a leafy inner courtyard and carved stone stairs, houses the Historical and Folklore Museum (28-30 Vernardou, Open Mon-Sat 10:00-15:00), where you can see, among others, a large collection of Cretan weapons and battle standards. The Old Town of Rethymno is not just a colorful labyrinth of Venetian mansions, exquisite courtyards, historic churches, minareted mosques, elaborate fountains and ornate doorframes; it is also full of life. Walking around, you’ll smell flowers and freshly prepared food and see children playing in the streets, women of all ages sitting, sewing and chatting on doorsteps, and students filling the cafés and bars. The Old Town may be a travel destination, but tourism has not yet driven away its residents. 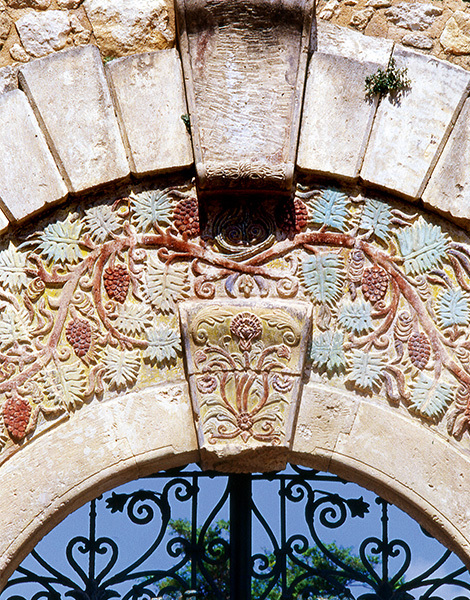 One of the beautifully carved stone lintels that adorn many courtyard and building entrances in Rethymno's Old Town. 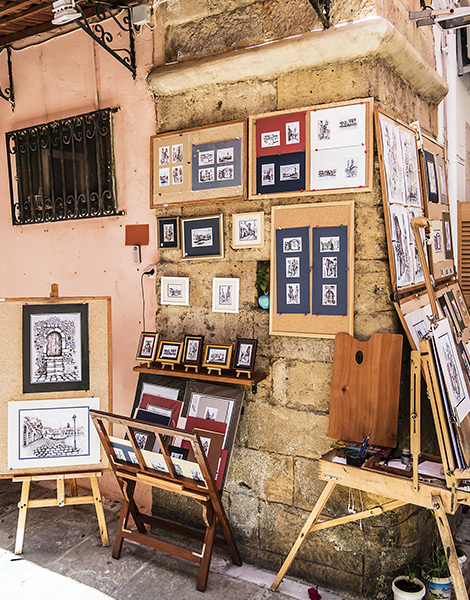 Handmade sketches of the Old Town make for popular souvenirs. For relaxation and sustenance, consider: morning coffee at Cul de Sac (7 Titou Petychaki) or at Living Room (5 Eleftheriou Venizelou) with a sea view. Traditional small dishes and good raki at Manousos (35 Titou Petychaki). Late afternoon coffee or an aperitif at Fraoules (62 Eleftheriou Venizelou) and Cavo (13 Akrotiriou) for the sunset in a dazzling setting overlooking the sea. You’ll find modern-design souvenirs at Greek Unique (3 Vosporou) and exquisite jewelry at the store of Hara Theodoraki in Govatzidaki Street in the Old Town. For handmade leather goods, visit Karras (46 Varda Kallergis) and for ceramic items, make your way to Artifacts by Omodamos (6 Himaras) or the workshop of Frosso Bora (25 Himaras). Don’t leave without trying some local treats: sweet tarts and ice cream made from fresh sheep’s milk at Mona Lisa (36 Konstantinou Paleologou), crispy sourdough biscuits and barley rusks at the bakery Apostolakis-Artoza (9 Kapodistriou), small savory pies and hand-shaped pastries at Sampson (3 Dimakopoulou) and delicious aniseed-flavored bread at Michalis Spanoudakis’ bakery (93 Nikiforou Foka). Lastly, at grocery stores around the city, don’t hesitate to inquire about the region’s famous cheese products, such as Gasparakis graviera, the delectable and light Tzourmpakis goat cheese, Maris’ fresh myzithra and dry cottage cheese, and fresh, creamy cheese from Amarino. For tsikoudia (Cretan raki), honey and exceptional extra virgin olive oil, visit the AgrecoFarm store on the coastal road (33-35 Sofokli Venizelou). On the edge of Europe, deep in paradise.